HEAVY TOLL: The Titans lost starting quarterback Marcus Mariota, tackle Taylor Lewan, tight end Delanie Walker and cornerback Adoree Jackson to injuries, which made it an especially tough debut for rookie coach Mike Vrabel. Mariota hurt his throwing elbow in the third quarter, left the game for one play, returned to throw two interceptions and departed for good. "I couldn't feel my fingers, feel my hand," Mariota said. "It was one of those things — couldn't grip the ball." "It's just go time," Gabbert said. "That's the backup quarterback's job description: to be ready at a moment's notice, to go in and help your team win the game." Gabbert didn't do that, going 11 for 22 for 117 yards and an interception that sealed the win for Miami. He'll have more notice if he's in the lineup for Sunday's home opener against Houston. Lewan left the game with a concussion. Walker was carted off the field later in the period with a right leg injury. Jackson hurt his shoulder on a 26-yard punt return. FRACAS: Lewan appeared to be briefly knocked out when flattened on Andre Branch's blindside block during an interception return by Reshad Jones. Lewan sprawled face down on the turf, then suddenly sprang to his feet, and players exchanged words and shoves. "There were a lot of words being said," McCain said, "and I don't think you can write them down." 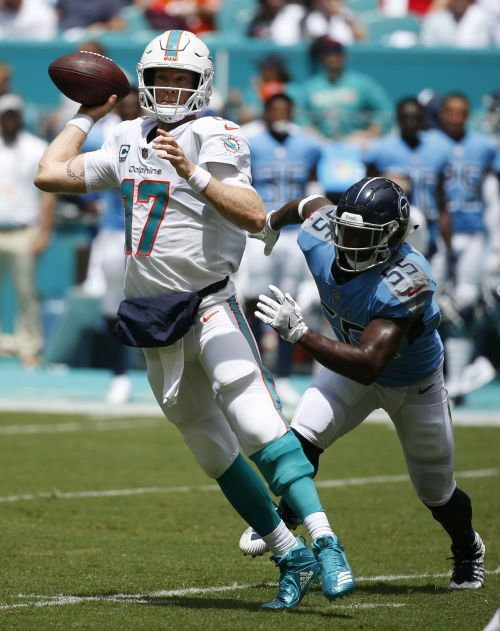 COMEBACK: Tannehill hopes to perform better Sunday at the New York Jets. Coming back from knee surgery, he played for the first time in 21 months with mixed results. Tannehill threw two interceptions, and the Dolphins twice came up empty on possessions inside the Tennessee 20. "I wasn't as sharp as I like to be," he said. Even so, Tannehill went 20 for 28 for 230 yards and threw two touchdown passes to Kenny Stills. BIG PLAYS: The Dolphins flashed their speed in the fourth quarter. Jakeem Grant scored on a 102-yard kickoff return, Stills caught a 75-yard touchdown pass and Jones returned his second interception of the game 54 yards. "You have three or four guys who are burners," Tannehill said. "It's a lot of fun to play with them." ANTHEM: Colin Kaepernick, a leader of the protest movement by NFL players against social injustice, tweeted his support after Dolphins receivers Stills and Albert Wilson knelt during the national anthem. "I know he has our back," Stills said. "Really, there has been a huge difference between when we first started protesting and now. A lot of people are reaching out and supporting us, so I really appreciate that. To everybody out there, thank you for reaching out, thank you for the positivity. Let's keep doing our best to make positive change and have these conversations and make our country a better place."